Lakeland’s WLAK began operation on May 15, 1936 from studios atop the New Florida Hotel in downtown Lakeland. The station originally operated at 1310 kilocycles with a power of 100 watts which was later increased to 250 watts. Shortly after signing on, WLAK aired the first ever remote broadcast in Polk County, a local church service, which became a regular part of its Sunday morning schedule. The station affiliated with the NBC network on September 25, 1938, a relationship that would last into the 1970’s. There were numerous WLAK owners in the early years. The station was originally owned by a small group of Lakeland businessmen, but they continued to lose money in their venture, even after the Tampa Tribune bought stock in it in 1939. On April 22, 1941, WLAK was sold to Bradley R. Eidmann for $13,000. Almost a year later, on April 15, 1942, S.O. Ward became the seventh owner in the station’s first six years of operation when he bought it from Eidmann for $23,000. By 1942, WLAK had moved its offices and studios from the New Florida Hotel to the shores of Lake Boney (now called Lake Bonny) at the end of what is today’s East Lime Street and transmitted on 1340 kilocycles. Although World War II was still on, Ward immediately began making preparations for enlarging the facilities and plans were drawn by local architect Donovan Dean. Just before the war ended, the first radio ratings survey was held in Polk County and it found that WLAK averaged 79.5 percent of the county’s listeners in the daytime and 82.5 percent at night. By the late 1940’s, WLAK could boast a staff of seven top flight announcers, each with a first class license and many years of experience. Offices and studios were located just within the city limits at the station’s 20-acre transmitter site, bordered on one side by Lake Bony and on another by an orange grove. 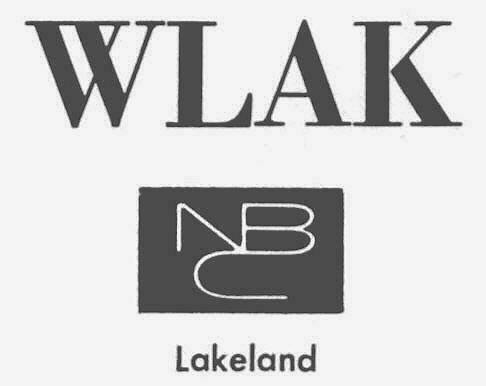 Compared to most small-town radio stations (and Lakeland was a small town back then), WLAK’s offices and studios were enormous, especially by today’s standards. No radio station in the South could boast of more or better equipment. On February 15, 1954, the FCC approved another power boost to 5000 watts daytime with 1000 watts at night. Although WLAK carried a heavy schedule of NBC network shows, it always made available sufficient time for the station to promote community interest and reflect the community life of the area it served. Local and community civic problems were discussed in weekly programs handled under the supervision of the Lakeland Real Estate Board and Junior Chamber of Commerce. The station also carried daily local news coverage and various music programs. By the late 1950’s, WLAK’s music library held about 20,000 records, one of the largest collections in the state and second only to WRUF, the University of Florida station in Gainesville, which was said to have had a larger library at that time. S.O.Ward sold WLAK in 1958 to Frank W. Nesbitt and Howard W. Cann, Jr. of New York for $300,000 and, in 1963, they sold it to Roland B. Potter’s Sentinel Broadcasting. One of the station’s community interest campaigns in the late 1960’s involved the wives and families of Lakeland area men fighting in Viet Nam. These loved ones here at home were invited to come down to the station and record taped messages which were then mailed to their servicemen overseas. In 1971, WLAK came to an end when Sentinel Broadcasting sold the station to a former CBS network staff announcer, Hugh Holder, who changed the call letters to WQPD and the music from MOR to Top 40. The station’s longtime NBC association also ended when Holder signed with ABC. In 1978, WQPD Station Manager Bob Kelly and a group of local business people bought the station, retaining the Top 40 format and most of the employees. The call letters changed again in 1983 when Root Communications of Daytona Beach bought WQPD and changed the calls to WLKF. After a period programming an Adult Contemporary music format, the deejays were cut loose and the station switched to an automated News/Talk format. In the mid 1980’s offices and studios were temporarily relocated to the Todd McKay Building in downtown Lakeland while the (former WLAK) building on East Lime Street underwent a $600,000 renovation. When the work was completed, WLKF and its sister station, WVFM 94.1, moved back in and shared studio and office facilities. Hall Communications has owned WLKF since 1996 when the operation was moved from Lake Bonny to its current location at 404 West Lime Street across from the Lakeland Center.